It's easy to look at Karan Higdon's stat line, 25 carries for 200 yards and 3 touchdowns, and feel good about things. It's easy to look at the line going into this game (UM -7) and think "Hey, we covered on the road!" and feel good about things. It's easy to watch Michigan's top-ranked defense and feel good about things. I want to feel good about things, I really do. I want to believe. But like the rest of you, I'm having a hard time getting there. On one hand, Indiana has always played Michigan tough, but realistically Michigan's issues far outweigh their strengths, especially when viewed through the scope of the remainder of the schedule and the difficult tests that await this team. 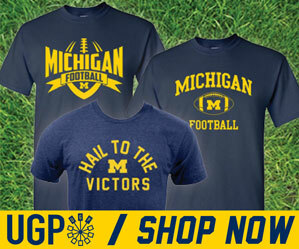 I have no doubt that Michigan can and will be competitive against opponents like Penn State, Wisconsin and Ohio State. But what will be the key is, can Michigan limit the mistakes, and catch enough lucky breaks to be able to hang a win on an opponent they're not supposed to beat...something Harbaugh has not been able to do in his two and half seasons in Ann Arbor. And at this current moment, Michigan is not supposed to beat any of those 3 teams. To get there, mistakes must be limited. Michigan didn't turn the ball over against Indiana, the first time this season Michigan was able to go turnover-free for a whole game. But penalties were a factor in this game. Michigan set an all-time program record with 16 penalties for 141 yards. Oddly, in their first 5 games of the season, Michigan only had 7 penalties in each game. Mistakes went both ways, Indiana helped Michigan out a few times. Holding, pass interference calls are one thing and they're going to happen, but personal fouls can and should be curtailed. No excuse for those. Up 20-10, and with the defense stifling Indiana's attack, Michigan seemed to be in control of the game. But a 53-yard punt return put Indiana right back in business. After the ensuing touchdown, the failed onside attempt (which was called correctly) almost put Indiana back on offense with great field position and a ton of momentum. But ultimately, that was not what this game came down to. Ever since the Michigan State game in 2015, Iowa, Ohio State and Florida State last year...and then Indiana yesterday...one common thread has been an issue in close games for Michigan. They can not run out the clock to end a game. It's a simple concept: Run the ball, get a first down, take a knee, game over. But Michigan can't do that. I get it, it's not easy to do...they know you're going to run the ball. But at that point it simply comes down to who wants it more. Michigan, in close games, can't get it done. Once in overtime, Karan Higdon saved the day with his 25-yard touchdown run on the first play. Indiana ran 6 plays in their overtime period, including 4 from inside the 4 yardline. But Michigan's defense held strong and forced a desperation lob by Ramsey which was intercepted by Tyree Kinnel to end the game and give Michigan their 5th win of the season. Coming off of a horrible performance against Michigan State, it was good to see the offense find a spark in Higdon...they needed it. It's clear to anyone watching that Michigan has real problems on offense...from the inconsistent line play, turnovers, penalties, and of course the quarterback position. O'Korn was pretty ineffective yesterday, 10 of 20 for 58 yards. 58 yards is basically the width of the field. The width. It is clear that John O'Korn is not the QB this offense needs to be able to hang with teams like Penn State, Wisconsin and Ohio State. I don't know if or when Speight will be back, or if Brandon Peters is ready...but I do know what John O'Korn isn't the answer. Easily Karan Higdon's 200 yards on the ground. This was a breakout game for the junior from Sarasota, FL. When the line blocked, he found the holes and made some pretty impressive runs. Those holes weren't there all day, but they were there enough and that's something that Michigan can build off of going into Happy Valley this week. It wasn't that John O'Korn did anything particularly wrong in this game...he made relatively safe throws, but he just didn't do much right. Indiana has a middle of the road pass defense, but it was good enough to completely stifle Michigan's passing game. O'Korn missed some wide-open receivers and tight ends which would've broken this game wide open. It's clear he doesn't have the ability to check down properly or see where open guys are. At some point, and that might be after the next game, it might be time to start thinking about the future. O'Korn is gone after this year, so continuing to develop something that isn't there isn't going to do Michigan much help next year and beyond. Obvious call here. Who else would we give it to? The big man had himself a day. Spent most of the game in the backfield, tallied 6 tackles, 1.5 TFL, half a sack, and made the clutch field goal block which ended up being important given the game went into OT. Hit two field goals, one from 38 and another from 40. Also made 3 extra points. In a game where the offense struggled again, the defense continued to bail Michigan out. Indiana is more talented than Purdue, Air Force and Cincinnati, and Michigan's defense continued to stay off of the field as much as possible.